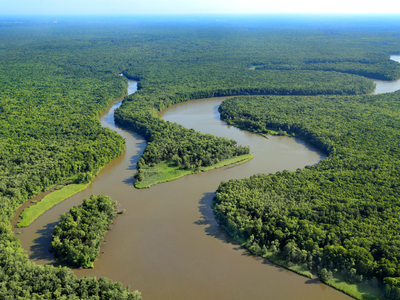 Befitting its history as one of the original colonial trade routes, the Savannah River supports a wide variety of human and natural values, and serves as a critical water resource to the states of Georgia and South Carolina alike. The largely rural nature of the Savannah River Watershed is threatened by urban development and contaminants. This watershed may be ripe for a watershed protection program, given interest expressed by the utilities in Savannah, Georgia, and Beaufort/Jasper, South Carolina.The Savannah River Clean Water Fund (SRCWF) covers the lower Savannah sub-basin, a 2.8M acre area encompassing five substantial municipalities serving 550,000 residents, and many commercial and industrial users. The states of South Carolina and Georgia are both participating. This document describes the water quality maintenance services performed by forests and well-managed agricultural lands. Peer-reviewed studies demonstrating these services are described, with links to many additional supporting resources. These water quality principles are then applied to the 2.79M-acre Lower Savannah River sub-basin below Thurmond Dam at Clarks Hill, South Carolina. GIS analysis and a conservation priority model based in these principles were applied to the lower Savannah River sub-basin to create a vision for how land protection in the sub-basin can maintain these services indefinitely.